1. A friend will encourage you as you reach for your goals. 2. A friend will challenge you when you need the extra push to work a little harder. 3. A friend will be your strength when racing when you reach a tough point. “Borrow” their strength and use it to pull you through. 4. A friend will laugh with you when you train together and wear crazy running outfits with you or be there when you miss your goal or have a tough run. 5. When you train with a friend there is a quiet understanding that some days it’s better to just run and be quiet but sometimes the company is what you really need. Thanks! I just love my friends and love that they are all amazing runners too! Gotta love Pooh! My best running friend is my husband. I love that you run with your husband. My husband is planning to try trail running. I can’t wait to go on some adventures with him. Do you train for long races together? I just loved this Pooh quote. Seemed very fitting! YES! I can’t wait to hear what you think about the avocado egg salad recipe! Happy running! Love the Pooh picture! So cute. 🙂 And I definitely agree about running with a buddy. Mine is my husband! We’ve trained for two races together and it’s been an incredible bonding experience! That is awesome that your husband trains with you. My husband is actually thinking about getting into some trail running. I am so excited to have him join me on the trails! Thanks for checking out my blog. Happy running Julie! 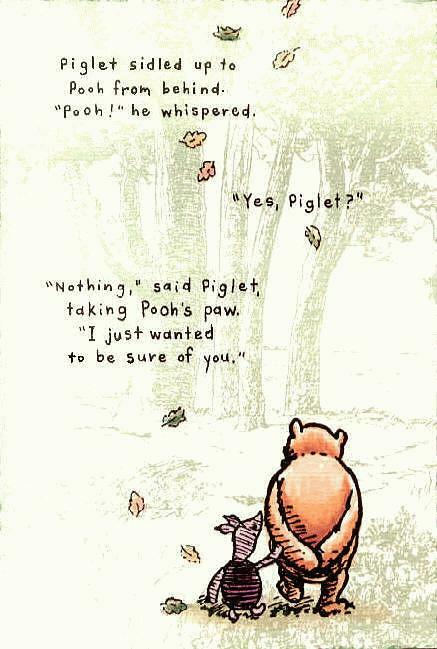 you had me at Pooh. I love my running friends as well.. nothing better than someone who completely understands our sport, and helping each other get through those tough moments is priceless.